Did you know it’s Earth Week? If you haven’t already pledged your Act of Green, head over to EarthDay.org and do so now. When we blogged about the Crown Prince Green Team in February, we shared several initiatives that our Green Team has been pursuing since its formation in 2008. These initiatives ranged from electricity reduction, carbon disclosure, “Back to the Tap” water pledges and tree planting. Last week the entire company participated in a sustainability seminar geared at identifying ways that Crown Prince as a company can reduce our carbon footprint on the environment. Although this movement starts with us, we are hoping to encourage our trading partners and consumers to join in. Our most active initiative is that of education. Each week, the Green Team shares green-living tips giving the entire Crown Prince team advice on healthier, greener living both at work and at home. We’ve been sending these emails internally since July 2008, and we can only imagine the many small (or not so small) changes that have come as a result. Many types of plastic bags can be recycled: from grocery and newspaper bags to cereal box liners and furniture wrap. Find a full list here. 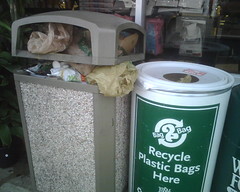 Though often too light for curbside recycling, many plastic bags are collected at grocery and retail stores. This includes major retailers such as Target, Best Buy and Lowes Home Improvement. The trick to recycling plastic bags at home is to remember to take them with you to the store. Try writing “bring plastic bags” at the top of your grocery list. To collect the bags in your house, hang a canvas bag over the doorknob and place emptied plastic bags in it for easy transport when you’re ready to go. So, what will your small change be? Share in the comments, or follow us on Facebook. Oh, and Happy Earth Week! Thanks for such an excellent blog. Yes, it’s true that the plastic bag is the biggest problem faced by the world. The methods which were shown in this blog will surely help the people as well as the businesses. 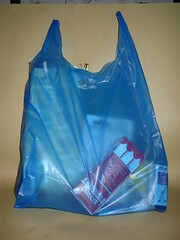 People themselves can carry sack bags instead of buying plastic bags while going to the grocery. These environment-friendly bags should be used everywhere.